Throughout his life, Jake Portman enjoyed hearing his grandfather’s stories. The elderly Abe would tell Jake of his childhood spent at an orphanage designed to protect children with peculiar abilities, and also told him about monsters. Jake believed these stories as a child, but now as a sixteen-year-old, he has started to doubt them. None of his family believe the stories. However, Jake’s psychiatrist Dr. Golan advises Jake and his father to visit the site where his grandfather said the orphanage was. There, Jake learns that there is more to the stories than he believed – and there is some important work for him to do. As it turns out, peculiar abilities are recessive genetic traits. Jake and his grandfather share the same trait, while none of the rest of the family have – or understand – peculiarities. They are both able to see hollowgasts, terrifying but invisible monsters who prey on peculiar children by eating their eyes. Abe has dedicated his life to fighting off hollowgasts, and was ultimately killed by one. Jake found his grandfather dead in the woods, with his eyes removed. 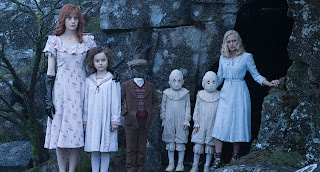 Now, Jake discovers the orphanage where his grandfather spent his childhood, and he must take up his grandfather’s work, keeping the hollowgasts from harming the children in the orphanage’s care. Miss Peregrine runs a home for children with special but odd characteristics which separate them from other people. She fills a motherly role to her charges. Jake travels abroad the visit the orphanage in which his grandfather was raised, hoping to find answers to his own questions. In that sense, this story reminds me of David Quint’s documentary Father Unknown. Jake’s grandfather cares deeply about him, and because of one character’s power over time, Jake is able to reconnect with his grandfather, even though his grandfather had died. Several characters act selflessly and bravely to help others. Jake’s grandfather told him true things which others said were fanciful stories. Abe asserts that he would never lie to Jake, but Jake challenges hi, saying that he did lie. Eventually, the orphanage is destroyed and the kids who had been safe there must find a new home. It seems like Jake may have left his parents behind forever in order to follow his grandfather’s mission. 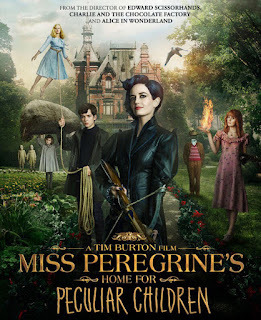 Miss Peregrine has to be taken from her children; she bids them well, and charges 16-year-old Jake with trying to keep them safe – then she is taken away by a villain. 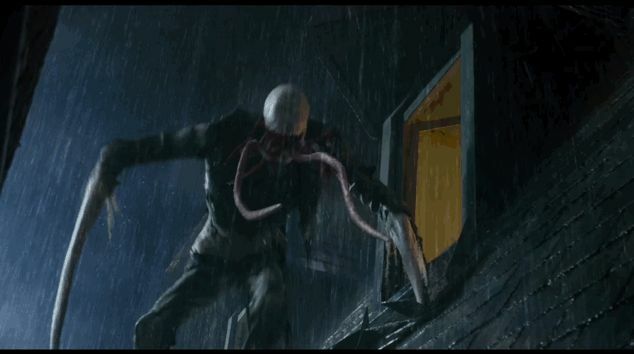 There are some nightmarishly scary elements to the film. The hollowgasts are terrifying, and we see them eat at least one character’s eyes out of his head; in another scene, people are sitting at a table, treating human eyeballs as delicacies. 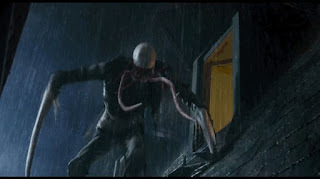 A teenager brings inanimate objects to life, only to watch them brutally fight to the death; he also reanimates the body of a teenager who has been killed by a hollowgast. An adult almost kills Jake with an axe. The themes of running, hiding, and being displaced by violent monsters could be triggering for young children or even teenagers who remember being the victims of violence. 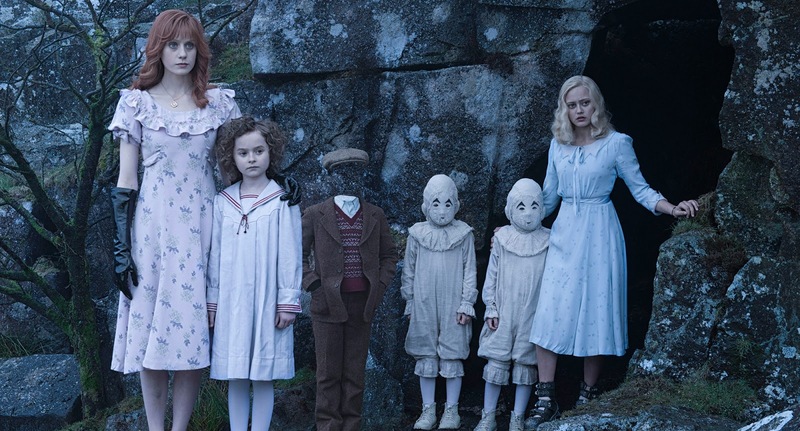 Miss Peregrine’s Home for Peculiar Children presents a fantasy world in which adults and teens act selflessly and heroically, and there are some worthwhile scenes, but the film has nightmarish villains, grotesque elements, and threats of displacement and violence. Some teens and adults might enjoy this one, but it will not likely be a good choice for kids and teens who have experienced violence or trauma. This one might be best left to older teens and adults. When have you seen adults acting heroically to help others? If you could have a peculiarity, what would it be? If you couldspeak to a loved one who is no longer in your life, who would it be, and what would you tell them?